Assets invested in Exchange Traded Funds (ETFs) just broke through the $3 trillion milestone, 25 years since their birth.1 At Elm Partners we use ETFs extensively, making up about 40% of our $390mm assets under management. An often quoted advantage of ETFs is that they can be easily traded all day long, rather than once a day at the close as with traditional open-ended mutual funds. At Elm Partners, we invest with a long-term horizon, and we believe that ETFs have at least three less publicized advantages for long-term investors like us, namely: 1) insulation of long-term holders from the trading costs induced by investor turnover, 2) improved tax efficiency, and 3) lower cost structure. Not everyone is a fan. Critics argue that ETFs are a source of financial instability. Ironically, some of the most strident criticism comes from Jack Bogle and Larry Fink, the founders of the two biggest ETF sponsors, Vanguard and Blackrock. They argue that many of the nearly 6,000 available ETFs do not have the desirable features we should expect from passive, index oriented products, such as low cost, diversification, transparency and simplicity. We agree with this criticism, and avoid ETFs with labels such as “synthetic”, “actively managed”, “leveraged” and “inverse”. However, we disagree with Bogle when he states that ETFs are “just great big gambling, speculative instruments that have definitely destabilized the market.”2 We believe the ETF structure is a source of financial stability, and better for long-term investors, as compared to traditional mutual funds. Here’s why. In a traditional mutual fund, the costs of having to buy or sell securities to accommodate incoming or departing shareholders are borne by the investors who remain in the fund, rather than by the investors who trigger those costs. In normal times, these costs can add up to as much as 0.10% of extra annual cost for long term mutual fund investors.3 However, in times of crisis this flawed design feature is exploited by sophisticated investors who make a concerted rush for the exit, so that they can get out at the mid-market net asset value (NAV) price, leaving the remaining investors to bear the heavy cost of the liquidations they instigated. By contrast, in an ETF, competing brokers (called Authorized Participants) create and redeem ETF shares in exchange for the basket of individual securities that comprise the ETF.4 No trades take place, and hence no costs are incurred, inside the ETF as investors enter or exit. Existing ETF investors are thereby insulated from the costs of buying or selling securities to accommodate subscriptions and redemptions. In turbulent times, this mechanism protects long-term investors while accommodating investors who want to exit at a fair, non-subsidized price. True, an ETF which is based on underlying assets that are not very liquid, such as high yield bonds, can give investors a false sense of liquidity. If many holders want to sell, not only will the price of the asset class fall dramatically, but the arbitrage mechanism will not stop the price of the ETF going to a substantial discount to NAV, and even to a discount to the bid side of the underlying assets. While this isn’t a pleasant scenario for the holder of that ETF, we think it is much better than what happens with an open-ended mutual fund structure. With ETFs there is no incentive for investors to be first out the door, as each investor bears her own marginal cost of increasing or decreasing the fund size. 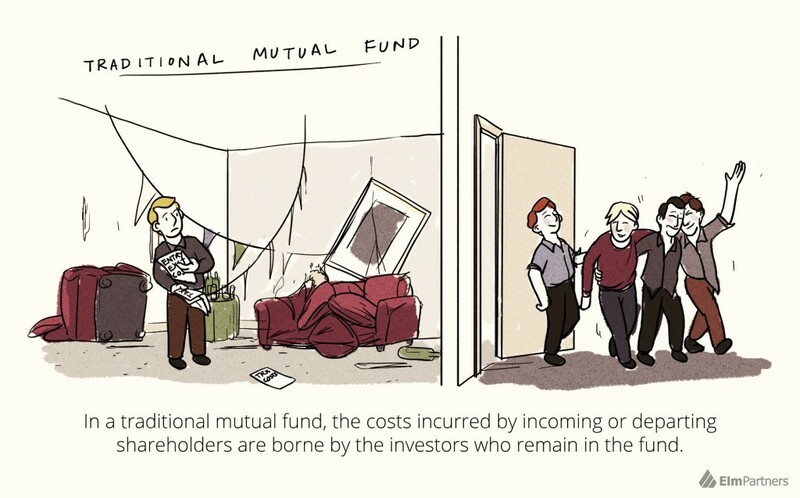 The second, related, reason we like ETFs is that they are more tax efficient than typical open ended mutual funds.5 US mutual fund tax accounting means that realized capital gains caused by redemptions are allocated to all investors who hold the fund at year end, even though those remaining were not responsible for triggering the capital gain. The tax basis of their holding will be increased, so when they eventually redeem, there won’t be a double counting of capital gains, but the acceleration of their tax liability and the potential of being allocated higher-taxed short term capital gains is unpleasant and unfair. With ETFs, redemptions do not trigger sales that generate capital gains. 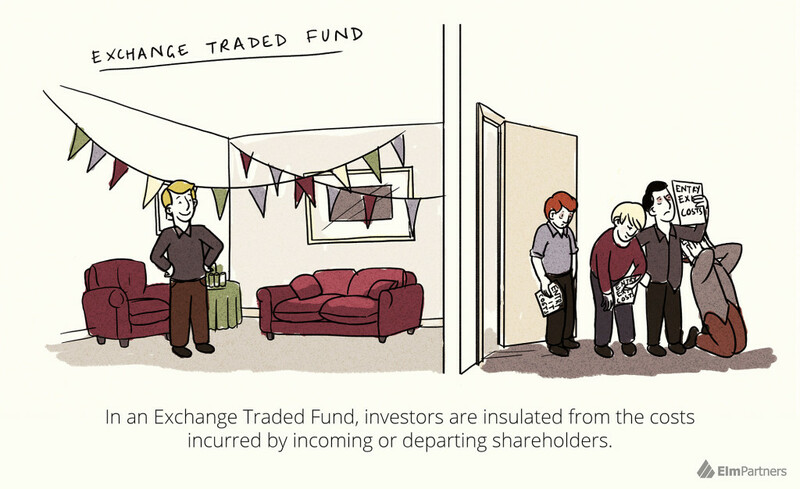 Instead they cause the fund manager to deliver a basket of the underlying fund assets to the Authorized Participant who in turn gives shares of the ETF to the fund manager for redemption. The tax efficiency can be further enhanced by the fund manager delivering the lowest basis tax lots held inside the fund to the Authorized Participant. The ETF tax advantage, over a long term horizon, can be worth as much as an extra 0.5% of annual return on an after-tax basis for US taxable investors.6 ETFs tend to be more tax efficient than their mutual fund counterparts for non-US offshore investors too. For example, the withholding tax rate on Irish listed ETFs that invest in US equities is 15%, as compared to 30% for comparable Irish listed mutual funds. Finally, ETFs are typically cheaper to run than mutual funds, and this cost saving tends to get passed on to investors. ETFs usually have lower marketing, distribution, accounting and administration (including KYC and AML) expenses. This probably explains why Vanguard charges higher fees on its mutual funds than it does on its ETFs.7 Many ETF trades do not trigger a subscription or redemption with the related trades in the basket of securities underlying the ETF. Rather they can be traded between a buyer and seller of the ETF itself. These direct trades in the ETF, bypassing the basket, are referred to as the ‘ETF liquidity layer,’ which can lead to an ETF trading at a much tighter bid-offer spread than the underlying market, thus reducing the total cost of investor turnover. Investing in an ETF does involve paying the bid-offer spread, and there’s also the risk that the price of the ETF declines in relation to NAV. These and other considerations mean that, contrary to the conventional view, an investor with a short term horizon may actually prefer going in and out of a mutual fund at NAV as compared to trading the ETF. You will see from our monthly portfolio reports on our website that we continue to use traditional mutual funds in many cases. We realize we have only scratched the surface of this topic, but we hope we have given you a different perspective on the ETF structure than the conventional view. We hope you’ll agree that the ETF is a valuable financial innovation that is of great benefit to long term investors like us. Please feel free to get in touch to share your thoughts or to delve more deeply into ours. For more information about Elm Partners and our investment strategy, please visit us at www.elmfunds.com or e-mail info@elmfunds.com. Globally, including ETPs, according to www.ETFGI.com. For simplicity in this note, we’ll use the term ETF to include ETPs in terms of overall marketplace description. For example, for a fund with 50% annual unmatched investor turnover (which can include net subscriptions), and underlying assets with a 0.20% average bid-ask spread. The sponsor can also accept cash or partial baskets, and if the sponsor is not careful, some of the costs can slip into the ETF. Generally, we’ve found that for the biggest ETF sponsors, they are very careful. Also, we should mention that many of Vanguard’s US listed ETFs are a hybrid structure, which has features of both a mutual fund and an ETF. A detailed treatment of this hybrid structure is beyond the scope of this short note. We are not offering tax advice. Please consult your tax advisor. Based on a 24.4% effective marginal tax rate for long-term capital gains, a 3% dividend yield and long-term growth of 3.5% pa. This is generally the case for Vanguard’s US listed Investor shares vs ETFs, and also the case for their Irish listed fund and ETF products.